A coup that could destabilize Central America and send shockwaves through Washington…a truth you would never have thought possible. 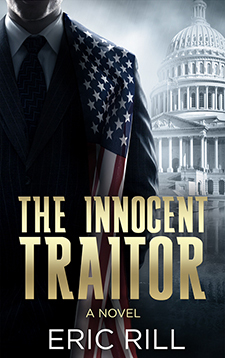 The Innocent Traitor, Eric Rill’s riveting new thriller, plummets the reader into the secret corridors of international espionage and politics as it follows the lives of two immigrants who risk everything to reach America, unaware of the perils that await them. János Stern flees Budapest at the onset of the Hungarian revolution and is recruited by the CIA, where an ugly secret surfaces that threatens to destroy his career and compromise the security of the United States government. Karel Horák escapes from Czechoslovakia during the 1968 putsch and becomes a powerful and successful hotelier. But even power and success cannot protect him from the front lines of a coup that could destabilize Central America and send shockwaves through Washington. How the lives of Stern and Horák and their families come together is an intense life-and-death drama that will keep you turning the pages until you discover a truth you would never have thought possible.